I think I’ve driven to work twice in the last year. My saving the world aside, this microscale scene by rhdlb is beautiful, with a pair of excellent buses and some great details built into the base. I also really like the street lights. And how does a car destroy the world? The world will live on long LONG after humans are dead. Oh don’t start that. Just let Andrew say what he wants and move on. 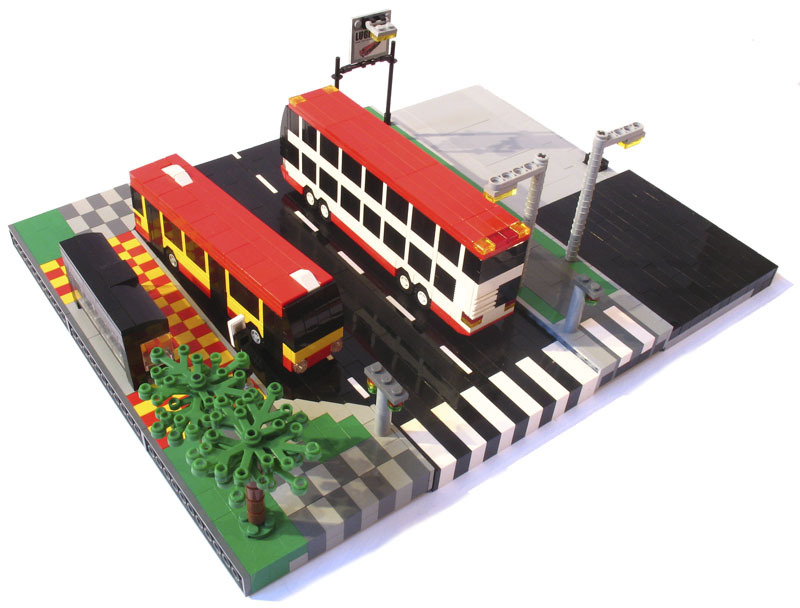 Surely there are more constructive things to do than argue environmentalism on a Lego blog? Hmm strange…I was saying true to David4. Took a while to get posted. Hmm whatever. Silly Andrew, don’t you know that not buying gasoline is one step away from being a terrorist. Any decent American knows that oil consumption and capitalism are an integral part of the U. S. constitution. I think the point is that people will be making it uninhabitable for themselves and other organisms. True the world will still be here. But will we? It’s a nice bus, I really love the sidewalk. The world has been around 4 billion years, it has survived much worse then humans and it will survive long after we are dead. We don’t need to save the world, we need to save ourselves. All humans are doing is speeding up a nature progression that would most likely kill off humans anyways, we are not adoptive at all, and the planet changes greatly. There was some great program on Discovery or something about the history of our planet. Life lived through so much worse than what is going on. 70-95% of species will die and the planet will live on. We kill ourselves, fine, the sooner the better for the other species on the planet. However no matter what some life on this planet will live on until the moon spins away (it will) or the sun expands, or the magnetic field fails. Buses save the world? More people have been run over and killed in my town by buses than cars! That being said, I like the model, I wish I could do these microscale ones, they take a lot of thought. I especially like the fact the surface is using flat tiles, they make the model look very sleek.